The 1918 influenza pandemic affected the whole world. Could it happen again? “This virus killed more people in 24 weeks than HIV killed in 24 years. This has been described as the greatest medical holocaust in history”. The quest for a universal flu vaccine now remains a tantalising shimmer on the horizon. It’s not a completely crazy idea, Dr Short said, and it could happen within our lifetimes. But to ensure we live long enough to see whether it eventuates, we need to be prepared to meet pandemics now. If you want your friend to vaccinate their kids, don’t try to change their mind: I know that people who know the life-saving utility of vaccines get very frustrated with those who are convinced that vaccines will harm their children. In an age in which polarisation of opinions is the norm, people think the best means of convincing those on the other side of the fence is to shout them down. And so ensue social media scuffles sprinkled with name-calling and bad language. This site has seen its share of that. What this article tells us is those scuffles serve no purpose whatsoever. Vaxxers will vax, anti-vaxxers won’t and all the argument in world won’t convince either side to give in. So, are we to throw our hands in the air and give up? Does preaching to the choir serve any purpose? We are here to provide evidence-based information to guide people in their decision-making. We help people who are unsure on certain issues and are looking for help. We’ll never get an anti-vaxxer to immunise their kids, but we might just reassure anxious parents who only want the best for their kids. How kindness can make a difference in cancer care: Cancer may not be life-ending, but it usually is life-changing. A cancer diagnosis instantaneously turns life upside down for patients and families. 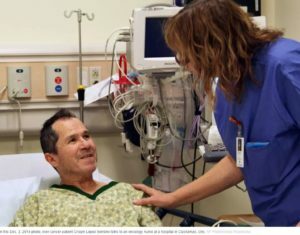 Cancer care is a “high-emotion” service, and the care team must not only effectively treat the disease but also address patients’ intense emotions. While accurate diagnosis and effective treatment are paramount, simple acts of kindness can be a potent antidote to negative emotions and may improve outcomes for those experiencing the frightening journey called cancer. The use of agar to culture microorganisms – A brief history of agar: Derived from seaweed, agar is used in laboratories all over the world to grow and research the many microorganisms that can harm and help us (or sometimes both). Tablet could “delay prostate cancer spread by two years”: A new drug has gained approval for managing and treating prostate cancer in the US – hopefully it arrives on our shores soon. The drug blocks androgen (hormone) receptors which stimulate prostate cancer cells to divide – clinical trials showed treatment reduced cancer growth and metastases in prostate cancer patients at risk of metastasis. Importantly, the drug has minimal side effects – serious adverse events were not significantly higher in the treated group, and the most common adverse events associated with treatment were fatigue and rash. For those wanting more specific info, a scientific publication can be found here: http://www.nejm.org/doi/full/10.1056/NEJMoa1715546.